One simple question the BASICS study can help answer for the K-12 computer science (CS) education community relates to who is currently teaching introductory high school CS with the Exploring Computer Science (ECS) curriculum. The field is engaged in unprecedented efforts to expand opportunities in K-12 CS education, and with that expansion comes the need for CS teachers. Yet readily accessible information about the current national landscape of the high school CS teaching population, including ECS teachers, is lacking. In 2013, we conducted a collaborative landscape study to establish a more comprehensive understanding of the nation’s high school CS teaching population at the time and the contexts in which they taught. Several years later, we want to know more about introductory CS teachers specifically—what are their backgrounds, education and training, experiences with teaching, and reasons for teaching with ECS? This information is important not only to the BASICS research as it relates to the supports for and barriers to implementing introductory CS (the “influential factors”), but also to district and school leaders looking for teachers who can teach high school CS, curriculum developers and teacher training organizations working to construct appropriate teacher professional development as CS course offerings grow, and the CS education community in general seeking to understand components of the current CS teacher landscape. 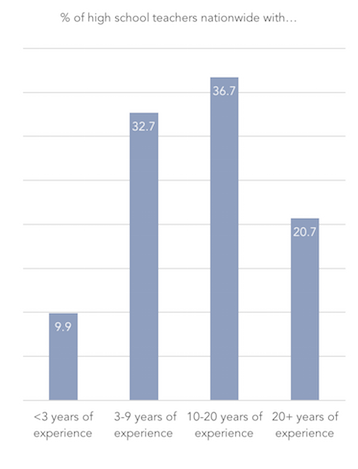 The data below show information about teachers that teach with ECS who responded to an online questionnaire administered by the BASICS team in the spring of 2015. High school teachers using ECS in five regions across the country (Broward County, FL; Chicago, IL; Los Angeles, CA; New York City, NY; and Washington, D.C.) were invited to participate. In total, 130 teachers provided usable data. National* and district** data are provided, where available, to contextualize the BASICS findings. We define factors as contexts and conditions external to the innovation itself that can influence implementation, either by supporting or inhibiting it. These include characteristics of the innovation itself, individual users, the organization(s), and the environment. Examples of factors measured in the BASICS study include factors related to teaching in general (e.g. resourcefulness and coping, innovativeness), factors related to teaching CS in general (e.g. sense of efficacy in teaching CS, attitude towards ECS), factors related to teaching with ECS (e.g. understanding the innovation, intrinsic and extrinsic motivation), and factors related to descriptive characteristics of teachers (e.g. education, experience). What are the BASICS ECS teachers’ backgrounds? There were more male respondents than female respondents. 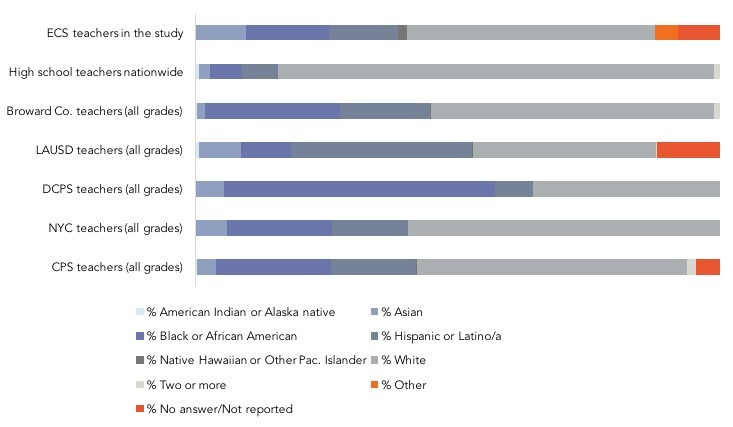 If responses are representative of teachers using ECS in the study area classrooms, this is in contrast with the trend among high school teachers of all subject areas nationwide, which shows that there are more female teachers than male teachers across the U.S.
About half of the teachers in our sample identified as white. A smaller proportion of BASICS ECS study teachers identified as white than teachers of all subject areas in the national high school teaching population. To help contextualize the study sample, available racial/ethnic identity data for all subject teachers (of all grades) in the major school districts in each region are also provided here. Teachers of all ages teach ECS. 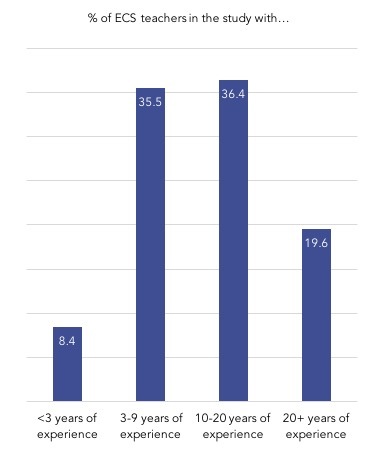 There were fewer teachers in the BASICS sample under 30 years, and slightly more in the 50 – 60 years range; however, there were teachers of all ages teaching introductory CS with ECS. Teacher shortages As computer science (CS) education initiatives continue to expand, there is concern about a shortage of prepared CS teachers. This issue of a lack of teachers is not unique to computer science; in fact, a number of reports focused on the issue of teacher shortages nationally have recently been released. The following resources discuss the problem and potential strategies to address it that are relevant to both the CS community and educators at large. What kind of teaching experience do BASICS ECS teachers have? Teachers in our sample had a similar range of experience to high school teachers nationwide. And teach a variety of courses in addition to introductory CS with ECS. 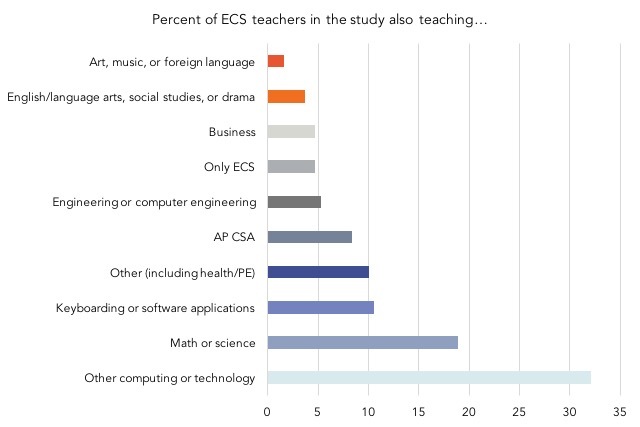 Over 40% of the BASICS ECS study teachers also taught computing courses beyond introductory CS with ECS (AP CSA or other computing or technology), while almost 25% taught mathematics, science, and/or engineering alongside their ECS course. 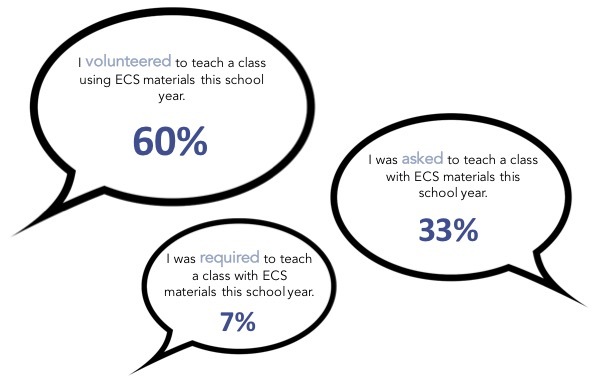 What kind of educational training do BASICS ECS teachers report? 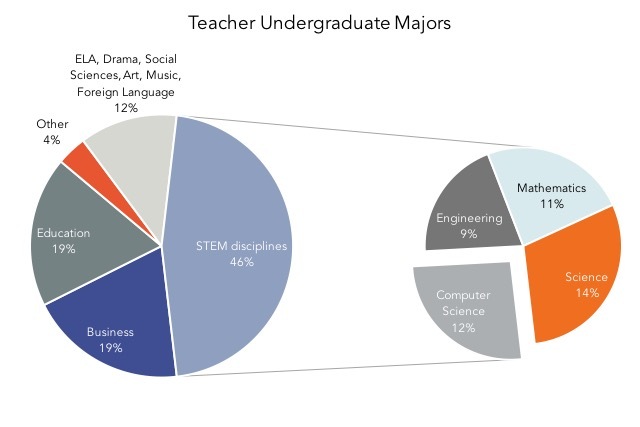 Just under half of the BASICS ECS study teachers majored in a STEM discipline (here, includes science, mathematics, computer science, engineering). Of those, only about one quarter majored in Computer Science. But many BASICS ECS study teachers have some prior training in CS. 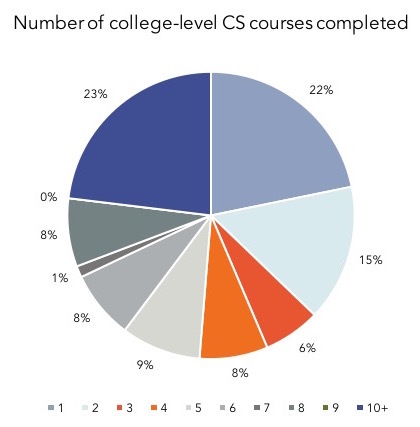 Almost three-quarters of the teachers indicated taking at least one college-level CS course; of those teachers, 37% completed 1-2 courses while 23% completed 10 or more courses. 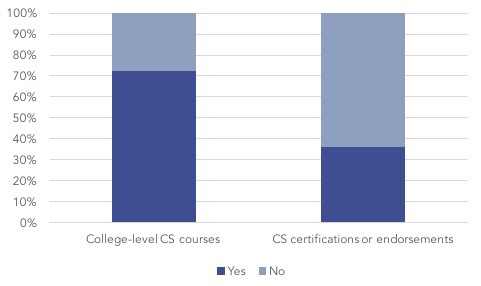 Over half of the study teachers reported holding a CS certification or endorsement. In interviews, some teachers reported that they had experience working in industry prior to their teaching careers, while others were very new to the field. Why are these teachers teaching with ECS? How did BASICS ECS study teachers end up teaching ECS? Almost all of the teachers who took the questionnaire were teaching ECS voluntarily—some offered to teach it or even brought the curriculum to their school, while others were asked by school leadership and agreed to teach the course. Less than 10% reported that they were only teaching ECS because they were required.